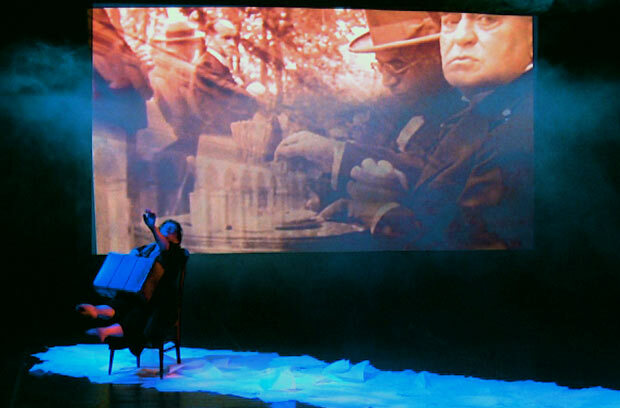 This latest duet by the Theatre de l’nge Fou, “Memory of Dust”, is a modernist fable on the enduring connections of two souls. Letters, words, poems, paper weave a timeless map on which a woman encounters the shadows of her life. 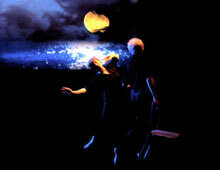 This work is a dialogue between Etienne Decroux’s piece “La Meditation” and the world of the Theatre de l’Ange Fou. “Memory of Dust” is a voyage evoking the tragic and absurd moments of destiny in a dream atmosphere punctuated by humor and derision, a portrait of the ‘unknown familiar’. The starting point for this duet was first performed at the Overture Center in Madison, Wisconsin as a part of the Kanopy Dance Company’s recital “Mime, Body, Spirit”. Performed by Corinne Soum & Steven Wasson. 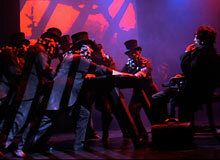 Performed by Steven Wasson, Corinne Soum and members of the Theatre de l’Ange Fou. Written and Directed by Steven Wasson and Corinne Soum Performed by Steven Wasson, Corinne Soum and members of the Theatre de l’Ange Fou. Films by Steven Wasson. From Ovid to Cocteau, the myth of ORPHEUS, the symbolic echoes in the story, no matter the interpretation, touch upon universal truths found in every religion, social system, psychoanalytical debate or political/material reality. It is a story old as the creation, an eternal mystery play that all souls individually live through: the loss, the sacrifice, that shaking of ourselves in order to find ourselves. Set in a mindscape of a wasteland, the Theatre de l'Ange Fou's adaptation of ORPHEUS follows the search through the underworld of Orpheus for his beloved. It is a leap into a personal hell, a madness where different scenes, coming and going as in "Alice", appear as a collage or x-ray of the mind. It is the journey through the serpentine labyrinth of love, played out in a 'Theatre of Operations', populated by mythic characters in the guise of family. From the Furies to the Devil, from the hanged man to the unknown soldier to the Alienist with many cures, Orpheus is enamoured and guided through this vaudevillian family reunion by the lonely shade of Death. It is the Everyman quest of being by dying through loving. Created and directed by Steven Wasson and Corinne Soum, ORPHEUS is both a continuation and development of the Theatre de l’Ange Fou's search to mirror physically on stage the inner world of thought and emotion, that collage of human existence. To make visible the invisible. 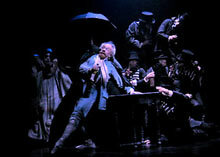 Touring and Performing: Theater Traume, Mainz, Germany, August 2004; Festival International du Mime, Perigueux, France, August 2004; Mimo e Mito, La Soffitta, ITC Bologna, Italy, April 2005; Pleasance Theatre, London, April 2005; Mostra SESC de Artes Mediterraneo, Sao Paulo, August 2005; Westival, Taunton, UK, August 2006. An adaptation of Gogol's timeless story of power and corruption set in nineteenth-century Russia. 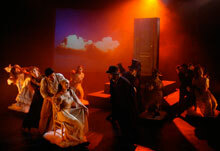 Steven Wasson and Corinne Soum’s adaptation of Gogol's classic story of power, ambition and mistaken identity. 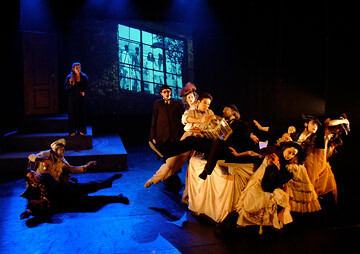 As performed by their international ensemble of 15 actors, the Theatre de l'Ange Fou, the show has played to critical and audience acclaim in Edinburgh (Total Theatre and Stage Award for Acting Excellence nominations), Israel (British Council tour), the 2003 London International Mime Festival, COS festival in Reus (Spain) and Ireland. Touring and Performing: Pleasance Theatre, London, March 2002; Edinburgh Festival 2002; Pleasance Theatre, July 31 to August 26, 2002; Israel Tour, December 2002; Pleasance Theatre, January February 2003; Reus International Mime Festival (Spain) October 2003; Hawk’s well Theatre, Sligo, Ireland, November 2003. Created in 1991-1992,the first ever reconstruction of twelve major pieces of Etienne Decroux, covering the full range of his solo and group productions of the 1930s, to his final pieces created in the 1980s with Steven Wasson and Corinne Soum. Pieces include The Meditation, The Trees (Les Arbres), The Carpenter, The Washerwoman, The Prophet and La Femme Oiseau. 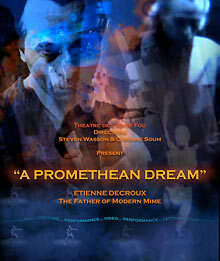 The show was originally funded by the French Ministry of Culture and commissioned by Movement Theatre International in Philadelphia where it premiered in 1992. 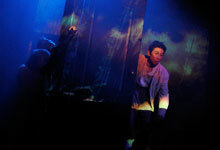 Touring and performing: Philadelphia International Movement Theatre 92 and 93 (USA); Hamburg International Mime Festival, Berlin Kunst Academie, (Germany); Teatro Testoni di Bologna, Festival Le Vie D'Intornno, Bergamo (Italy); London International Mime Festival 95, Southbank Centre (UK); Festival De Mime De Perigueux (France); two month run at the Theatre Le Ranelagh in Paris (France).